You can view, download, and watch database logs using the Amazon RDS console, the AWS Command Line Interface (AWS CLI), or the Amazon RDS API. Viewing, downloading, or watching transaction logs is not supported. You can view database log files for your DB engine by using the Amazon RDS console. You can list what log files are available for download or monitoring by using the AWS CLI or Amazon RDS API. If you can't view the list of log files for an existing Oracle DB instance, reboot the instance to view the list. Choose the name of the DB instance that has the log file that you want to view. Choose the Logs & events tab. Scroll down to the Logs section. In the Logs section, choose the log that you want to view, and then choose View. To list the available database log files for a DB instance, use the AWS CLI describe-db-log-files command. The following example returns a list of log files for a DB instance named my-db-instance. To list the available database log files for a DB instance, use the Amazon RDS API DescribeDBLogFiles action. You can use the Amazon RDS console, AWS CLI or API to download a database log file. In the Logs section, choose the button next to the log that you want to download, and then choose Download. Open the context (right-click) menu for the link provided, and then choose Save Link As. Enter the location where you want the log file to be saved, and then choose Save. To download a database log file, use the AWS CLI command download-db-log-file-portion. By default, this command downloads only the latest portion of a log file. However, you can download an entire file by specifying the parameter --starting-token 0. The following example shows how to download the entire contents of a log file called log/ERROR.4 and store it in a local file called errorlog.txt. To download a database log file, use the Amazon RDS API DownloadDBLogFilePortion action. You can monitor the contents of a log file by using the Amazon RDS console. In the Logs section, choose a log file, and then choose Watch. In addition to viewing and downloading DB instance logs, you can publish logs to Amazon CloudWatch Logs. CloudWatch Logs lets you perform real-time analysis of the log data, store the data in highly durable storage,and manage the data with the CloudWatch Logs Agent. AWS retains log data published to CloudWatch Logs for an indefinite time period unless you specify a retention period. For more information, see Change Log Data Retention in CloudWatch Logs. Amazon RDS provides a REST endpoint that allows access to DB instance log files. This is useful if you need to write an application to stream Amazon RDS log file contents. DBInstanceIdentifier—the name of the DB instance that contains the log file you want to download. LogFileName—the name of the log file to be downloaded. The response contains the contents of the requested log file, as a stream. 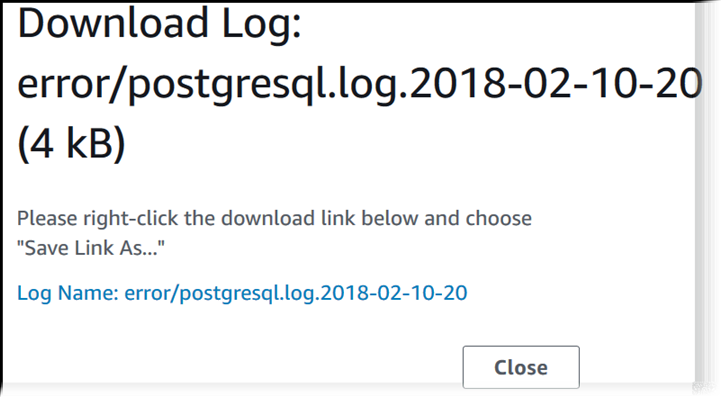 The following example downloads the log file named log/ERROR.6 for the DB instance named sample-sql in the us-west-2 region.